What is the rapture doctrine that has been so popularized in media, and in many so-called-Christian churches in recent decades? Can this teaching be found in the Bible? Or is this teaching a counterfeit? Is it a lie, or a mixture of truth and lie? What does Scripture really teach about the return of Jesus Christ and the fate of His Church at the end of this age? Please read on! Are you trusting in the "rapture" to spare you from end-time trials? Or does God have a more wonderful plan ahead for you? Is the "rapture" theory biblical, or does Scripture reveal that God's plan for end-time Christians is not what most imagine? Will God someday "rapture" away Christian airline pilots, leaving countless "unsaved" passengers to face gruesome deaths? Will the world's highways become deathtraps as cars lose their Christian drivers? If you were to go to a typical Protestant church and ask a hundred people, "Will God 'rapture' away true Christians before Jesus Christ returns?" a majority would answer "yes." 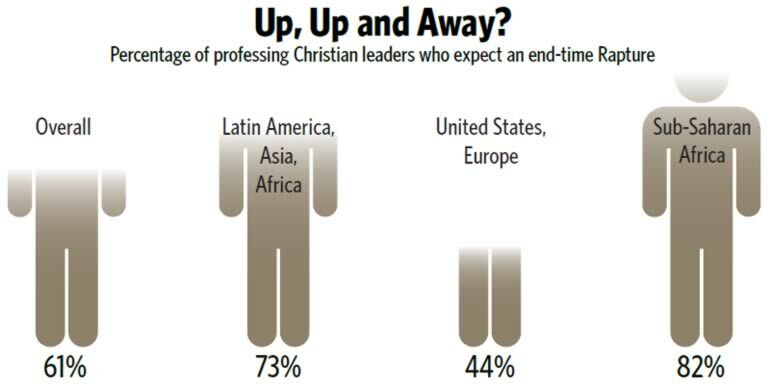 A 2011 Pew Forum study found that 61 percent of "evangelical leaders" expect believers to be caught up in the air to be with Jesus before the prophesied end-time judgments are inflicted on planet Earth, and more than half of those surveyed—52 percent—said they expected the event to occur within their lifetimes. Where does this idea come from? Is it biblical? Certainly it is not the Bible that has popularized this theory. Just as modern ideas about hell are largely taken from Dante's Inferno, many today take for granted the popular depictions of the rapture in books such as the Left Behind series by author Tim LaHaye. Yet the idea of the "rapture" is even controversial among those who consider themselves "Bible-believing" Christians. Why? Because it cannot be proved from Scripture, and was not even known to the Protestant world until recent centuries—and in fact it contradicts a number of clear biblical teachings about Christ's Second Coming! You have probably seen depictions of the Left Behind scenario. Christian airline pilots are snatched away, leaving their planes to plummet into the ocean. Major freeways turn into terrible accident zones as driverless cars plow into each other, causing injuries and deaths! Indeed, you may have seen the bumper sticker, "In case of rapture, this car will be without a driver!" To those who believe in this rapture theory, the unsaved will not just be left behind—many will go straight to hell, dying in gruesome circumstances in the absence of the "saved." What kind of cruel and capricious God would do that? In his book, Revelation Unveiled, Tim LaHaye attempted to prove that the Bible teaches a "rapture." LaHaye begins his "proof" by citing Revelation 4:1–2. But he quickly acknowledges: "The rapture of the church is not explicitly taught in Revelation 4" (p. 100). Amen! So, can we find, in that passage of Scripture, any indication of a "rapture"? No! Read it for yourself: "After these things I looked, and behold, a door standing open in heaven. And the first voice which I heard was like a trumpet speaking with me, saying, 'Come up here, and I will show you things which must take place after this.' Immediately I was in the Spirit; and behold, a throne set in heaven, and One sat on the throne" (Revelation 4:1–2). This very directly describes the Apostle John being taken "in the spirit"—probably through some kind of powerful vision—to the very throne of God in the third heaven. LaHaye somehow tries to reason that the Apostle John represents the Church—although the Bible never remotely hints of any such representation! Rather, the Bible always represents the Church as a woman—the affianced bride of Christ (2 Corinthians 11:1–2; Ephesians 5:22–24). LaHaye offers another argument for the rapture theory: "The absence of any mention of the Church in the rest of Revelation indicates that it is not on the earth during the Tribulation. There are sixteen references to the Church in Revelation 1–3, whereas chapters 6–18, which cover the Tribulation, do not mention the Church once" (Revelation Unveiled, p. 100). This is indeed a brazen statement, for the entire chapter of Revelation 12 is talking about the Church—and Revelation 19:7–9 clearly discusses the Church's coming marriage to Jesus Christ, as we will discuss later. Soon, LaHaye gets to the primary biblical passage on which all proponents of the questionable rapture theory rely. He writes: "The Apostle Paul was the special writer God chose to reveal to the Church the wonderful details of the rapture, when all Christians, both the dead and the living, will be 'caught up' (or raptured) to heaven to be with Christ (1 Thessalonians 4:16–17)" (p. 101). What "wonderful details" are given in these two verses that should prove the rapture theory? Let us study the entire context of this passage: "But I do not want you to be ignorant, brethren, concerning those who have fallen asleep, lest you sorrow as others who have no hope. For if we believe that Jesus died and rose again, even so God will bring with Him those who sleep in Jesus. For this we say to you by the word of the Lord, that we who are alive and remain until the coming of the Lord will by no means precede those who are asleep. For the Lord Himself will descend from heaven with a shout, with the voice of an archangel, and with the trumpet of God. And the dead in Christ will rise first. Then we who are alive and remain shall be caught up together with them in the clouds to meet the Lord in the air. And thus we shall always be with the Lord. Therefore comfort one another with these words" (1 Thessalonians 4:13–18). The Apostle Paul is here comforting the Thessalonian brethren about their fellow Christians who had recently "fallen asleep"—who had died. He said that God will bring with Him (with Christ) "those who sleep in Jesus." He then said: "For the Lord Himself will descend from heaven with a shout, with the voice of an archangel, and with the trumpet of God. And the dead in Christ will rise first" (v. 16). Revelation 8 and 9 clearly describe the "trumpet plagues" of God, and the awesome destruction they will cause over the entire earth. Then Revelation 11:15 tells us: "Then the seventh angel sounded: and there were loud voices in heaven, saying, 'The kingdoms of this world have become the kingdoms of our Lord and of His Christ, and He shall reign forever and ever!'" So Christ does not "sneak" back to earth to secretly "rapture" His saints away to heaven. Rather, He returns at the end of the most awesome, earth-shaking events in history—events that are felt and seen by everyone! Again, the Apostle Paul himself tells us regarding Christ's Second Coming: "Behold, I tell you a mystery: We shall not all sleep, but we shall all be changed—in a moment, in the twinkling of an eye, at the last trumpet. For the trumpet will sound, and the dead will be raised incorruptible, and we shall be changed" (1 Corinthians 15:51–52). So please get this one key fact straight: the saints of God—living or dead—are not raised or changed until after the powerful "last trumpet" has sounded. This basic fact alone completely obliterates the entire "rapture theory"! Jesus Christ clearly describes, in Matthew 24:3–33, the order of events preceding His Second Coming. Please read those verses very carefully! First, Jesus describes the false prophets who would arise and deceive the "many" (v. 5). Then, He describes war, famine, pestilence and earthquakes that would follow. Does Jesus then tell us that His saints will escape all this? No! Rather, Jesus tells us: "Then they will deliver you up to tribulation and kill you, and you will be hated by all nations for My name's sake" (v. 9). Many true Christians will be martyred before Christ returns—not "raptured" off to heaven! Then Jesus predicts the Great Tribulation, which is so awful that "no flesh" would be saved unless God intervened (vv. 21–22). Then verse 29 tells us: "Immediately after the tribulation of those days the sun will be darkened, and the moon will not give its light; the stars will fall from heaven, and the powers of the heavens will be shaken." The awesome heavenly "signs" come next, and then the glorious return of Jesus Christ at the "great sound of a trumpet" (v. 31) as the resurrected saints are gathered to Christ, their Bridegroom, and who then join Him in descending to the Mount of Olives. "Then the Lord will go forth and fight against those nations, as He fights in the day of battle. And in that day His feet will stand on the Mount of Olives" (Zechariah 14:3–4). Finally, Zechariah was inspired to tell us: "And the Lord shall be King over all the earth. In that day it shall be—'The Lord is one,' and His name one" (v. 9). By carelessly assuming that the Apostle John represents the Church, and by carefully bypassing the obvious and consistent meaning of the "last trumpet," among other misunderstandings, LaHaye tries to construct a platform from which to launch the "rapture theory." But his approach is totally unbiblical. Where, then, did this confused theory originate? Virtually all scholars acknowledge that the rapture theory was basically unknown and untaught until a man named John Nelson Darby came along. Darby was founder of the Plymouth Brethren Church. He described a system of biblical interpretation called "dispensationalism." This unusual scheme theorized that God has different rules for different groups at various times in human history. Darby taught that God had a "law" for the Jews, but "grace" for the Church. Later, Darby's ideas were refined and made popular by C. I. Scofield, who authored the Scofield Reference Bible. From this source, Protestant evangelicals became enamored with these teachings, even though they are so blatantly unscriptural. In an effort to find earlier origins for the rapture theory, LaHaye cites a number of dubious references that go back in time many centuries before Darby. For instance, LaHaye quotes from the writings of one Pseudo-Ephrem, yet admits that it is difficult to know who this man really was or when he wrote. Here is the quote from "Pseudo-Ephrem" used in LaHaye's book, Revelation Unveiled: "Why therefore do we not reject every care of earthly actions and prepare ourselves for the meeting of the Lord Christ, so that he may draw us from the confusion, which overwhelms all the world?… All the saints and elect of God are gathered together before the tribulation, which is to come, and are taken to the Lord, in order that they may not see at any time the confusion which overwhelms the world because of our sins" (p. 110). Please note that this allegedly ancient quote mentions no biblical reference to validate these ideas, and certainly does not mention the word "rapture." Another vague and even earlier quote LaHaye employs (p. 111) is from Victorinus, a Roman Catholic bishop, as early as 270ad. In a commentary on Revelation, Victorinus was discussing how God's people might be delivered from the plagues brought on by the two witnesses, described in Revelation 11. LaHaye states: "In his commentary on Revelation, he compared the plagues of that period with the plagues of Leviticus and then said, 'These shall be in the last time, when the church shall have gone out of the midst.' Obviously Bishop Victorinus of Petau, a brilliant Bible scholar living in the third century, saw the church departing before the plagues during the time of God's wrath, which from his commentary on Revelation 11 he took to be seven years. '(They) shall have gone out of the midst' was his way of describing the Rapture of the Church.'" What does this quote from an ancient writer tell us about the rapture theory? This quote says absolutely nothing about a "rapture." It only surmises that God's people—somehow, some way—would have gone out of the "midst" of this dangerous situation. By assuming that this ancient writer was referring to the rapture, LaHaye manages to put words into the mouth of Bishop Victorinus! But is there a genuine way of escape for God's people during the coming Great Tribulation? What does the Bible itself clearly teach? The Bible plainly teaches that God will provide a Place of Safety—"a place prepared by God" (Revelation 12:6)—for His people during the coming Great Tribulation. But this will not involve a secret "rapture," and the faithful saints of God will not go off to heaven. Rather, God will supernaturally protect them in a place right here on this earth. Describing the traumatic events taking place just before the Great Tribulation, Jesus told His followers: "And pray that your flight may not be in winter or on the Sabbath. For then there will be great tribulation, such as has not been since the beginning of the world until this time, no, nor ever shall be" (Matthew 24:20–21). Jesus never spoke of a rapture, but rather of the "flight" of His people. Note that we should pray that this flight to safety would not occur on God's Sabbath, for this coming flight will involve a degree of physical effort and stress—as did ancient Israel's flight from Egypt. If a supernatural "rapture" were involved, there would be no concern about the Sabbath or about the danger of traveling during the winter. That should be very clear. Later, Christ inspired the Apostle John to write in detail about the true Church being taken to a Place of Safety here on earth. Please study Revelation 12 carefully so that no one will be able to confuse you about this matter! In Revelation 12, Jesus reveals to John a vision of a "woman"—Israel—who brought forth the Messiah (vv. 1–2). Then Satan appears as a dragon, ready to "devour her Child as soon as it was born" (v. 4). Christ, the "male child who was to rule all nations with a rod of iron" (v. 5) is then caught up to God's throne in this powerful vision. Next (v. 6) the "woman"—now, clearly, the New Testament Church of God—has to flee to the "wilderness, where she has a place prepared by God." You can easily prove to yourself that heaven is never called a "wilderness"! Rather, this passage of scripture is describing the flight of God's true Church from the centralized areas of the Roman Empire—and from the persecutions of the great false church—to the "wilderness" area of the Italian and Swiss Alps from 554 until 1814ad! For, in the "day for a year" understanding of biblical prophecy (see Ezekiel 4:6 and Numbers 14:34) this would involve a 1,260-year period extending from the rise of the Roman Emperor Justinian in 554 to the removal of the final Holy Roman Emperor, Napoleon, in 1814. It was during this 1,260-year period that true, Bible-believing Christians were in the greatest physical danger from this foul system which God calls "MYSTERY, BABYLON THE GREAT, THE MOTHER OF HARLOTS AND OF THE ABOMINATIONS OF THE EARTH" (Revelation 17:5). Then, at the very time of the end, a spiritual war breaks out between Satan and his demons and the angels of God. This awesome spiritual war will probably take place within the next several years! Satan is defeated and is "cast to the earth… having great wrath, because he knows that he has a short time" (Revelation 12:9–12). Suddenly, inexplicably, an evil spirit will descend upon the area of the Beast Power in Europe and upon the leaders of the false church. Shortly, they will begin in earnest to plan the destruction of the United States, Canada and Britain! And they will swiftly begin to crack down on anyone who dares to preach the real Truth of the Bible. Such will be the beginning of the Great Tribulation. At this point, John writes that Satan "persecuted the woman"—now, clearly, the faithful New Testament Church of God (vv. 13–16). As in the typical fulfillment described in verse 6, the Church once again is guided by God to flee to a Place of Safety here on earth. For "the earth helped the woman… and swallowed up the flood which the dragon [Satan, v. 9] had spewed out of his mouth" (v. 16). Seeing the truly zealous Christians being taken to a Place of Safety where he can no longer get at them, Satan is "enraged with the woman, and he went to make war with the rest of her offspring, who keep the commandments of God and have the testimony of Jesus Christ" (v. 17). So those weak, lukewarm Christians "left behind" at this point are horribly persecuted by Satan the Devil and his minions. Some ministers attempt to apply verse 17 to the Jewish people. But this entire chapter is clearly talking about the "Israel of God" (Galatians 6:16)—ancient Israel at first (Revelation 12:1–4), and then the faithful New Testament Church of God—which during the Dark Ages was led by God to flee from the Holy Roman Empire during many persecutions, including the Inquisition (v. 6). Beloved as they are, the Jews do not have and do not follow the "testimony" of Jesus Christ (v. 17). So this final "flight" to safety absolutely applies to God's true Church! Near the end of His ministry, Jesus Christ gave this vital instruction to His people: "Watch therefore, and pray always that you may be counted worthy to escape all these things that will come to pass, and to stand before the Son of Man" (Luke 21:36). Very few professing Christians are obeying this commandment from the Son of God! For most people attend churches where biblical prophecy is seldom discussed and certainly not understood. They do not know what to "watch" for—and may have no interest in doing so. Frankly, most churchgoers today do not know how to pray. And they certainly do not "cry out day and night" to God as Jesus said His "elect" would do (Luke 18:7). Rather, the majority of God's own people are influenced—in this final, Laodicean age of the Church—to be "lukewarm." And the living Jesus Christ speaks powerfully to this attitude: "I know your works, that you are neither cold nor hot. I could wish you were cold or hot. So then, because you are lukewarm, and neither cold nor hot, I will vomit you out of My mouth" (Revelation 3:15–16). Apparently, lukewarm, professing Christians will be cast right into the middle of the Great Tribulation! (vv. 17–19). They have not been willing to present their bodies as a living sacrifice (Romans 12:1) and fully surrender to let Jesus Christ live His obedient life in them, so—as the Great Tribulation begins—God will not protect them and they will finally be forced to choose between total surrender to God or everlasting death in the Lake of Fire. God will, however, protect His most faithful servants! He will do so, supernaturally, in a place here on earth. Who exactly will be protected? God describes the way of life of His most faithful people: "Here is the patience of the saints; here are those who keep the commandments of God and the faith of Jesus" (Revelation 14:12). Just as His true Church is described in Revelation 12:17 as a commandment-keeping Church, so God's individual saints obey the Ten Commandments as a way of life—and they do not succumb to the siren song of so many ministers that God's spiritual law was "done away" or "nailed to the cross." The Bible is extremely clear about this! So, if you wish the divine protection of Almighty God in the traumatic months and years just ahead, be assured that it does not lie in being suddenly "raptured" off to heaven at any moment. Rather, as Scripture makes clear, our Creator will guide His most faithful people to know when and where to flee just before the Great Tribulation begins. They will be supernaturally protected in a place of God's choosing here on earth. Then, after the Great Tribulation, the "last trumpet" will sound, "and the dead will be raised incorruptible, and we shall be changed" (1 Corinthians 15:52; cf. 1 Thessalonians 4:13–17). There will be no "secret rapture" of the saints. The powerful trumpet blast of God will shake the earth before the saints of God arise! May God help you and your loved ones understand and be willing to surrender to the living Jesus Christ so that He may live His obedient life in you through the power of the Holy Spirit. As the Apostle Paul was inspired to tell us: "I am crucified with Christ: nevertheless I live; yet not I, but Christ liveth in me: and the life which I now live in the flesh I live by the faith of the Son of God, who loved me, and gave himself for me" (Galatians 2:20, KJV). Through Christ in you, may you truly learn to walk with God and have the genuine protection that Almighty God clearly promises for His true saints. Adapted from “Will You Be Left Behind?” from www.TomorrowsWorld.org.